Monnit wireless duct temperature sensors use an NTC type thermistor with 8 ft. UL listed plenum cable to accurately measure temperatures in duct work, while maintaining a sealed environment. The sensor will measure temperature in the duct work and send data to the iMonnit Online Sensor Monitoring and Notification System. 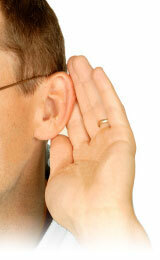 The data is stored in the online system and can be reviewed and exported as a data sheet or graph. User customization allows you to set notifications and alerts from the system so you can know immediately if temperatures are above or below an optimal range. 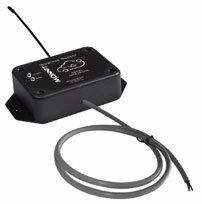 The sensor probe features mounting flanges and can be easily installed for long term use. • Accurate to ± 1° C (± 1.8°F). • Increased accuracy by user calibration to ± 0.25° C (± 0.45° F). • Probe temp range of -40°C to +150°C (-40°F to +302°F). • 8 ft. UL listed plenum cable. Industrial Cellular Gateway (CGW) is an advanced all wireless M2M gateway that enables fast time-to-market solutions for a wide range of M2M applications. The Industrial CGW allows your Monnit Wireless Sensors to communicate with the iMonnit™ Online Wireless Sensor Monitoring and Notification System via cellular transmission. This is the perfect solution for remote industrial locations where there is no existing internet connection and environmental conditions may be wet or dusty. Monnit's new Wireless Serial Data Bridge is a bidirectional serial to radio device capable of transmitting serial data over its wireless communication link and delivering wireless data, received in the radio, out of its serial port. The Monnit wireless serial data bridge can be connected to any device equipped with a serial data port, to capture the data and transmit it to the iMonnit online sensor monitoring and Notification System. The data is stored in the online system and can be reviewed and exported as a data sheet or graph. User customization allows you to set notifications and alerts from the system based on data received from the device. The serial data bridge is also fully configurable via the iMonnit online software. Monnit's development team is always hard at work developing new wireless sensing products and enhancing our existing products based on customer feedback. We are currently working on a new family of power sensors. 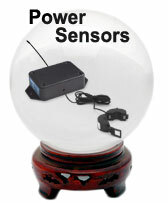 The new power sensors will provide a variety of solutions for monitoring and metering power applications. If you would like to learn more or be notified when these options become available, please email us at sales@monnit.com. Are you monitoring your Heating and Cooling systems for efficient operation and predictive maintenance? 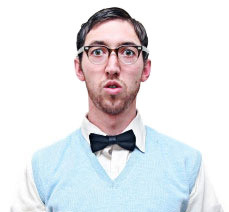 Do you know how often your HVAC system is running and if it is running within its correct specifications? Deviations from specified parameters if left unchecked, can cause expensive repairs and downtime. Using Monnit Wireless Sensors to test, track and remotely monitor your HVAC systems, allows you to maintain efficient operation and schedule maintenance or other actions to avoid the consequences of failure, before the failure occurs. Monnit wireless sensor systems can help you monitor equipment to help you detect issues before they become serious and costly. 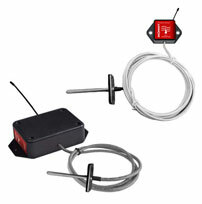 We recommend using the following sensors to track and monitor the operation of your HVAC equipment. 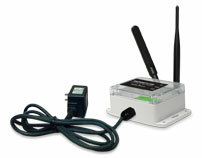 Wireless Activity Timers Monitor run times of HVAC motors and pumps. 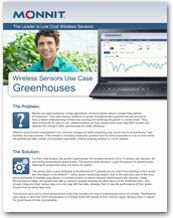 Wireless Accelerometers Monitor vibration levels of HVAC motors and pumps. Wireless Voltage Meters Monitor voltage to equipment and machinery. 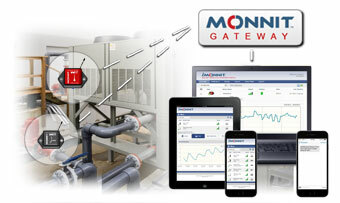 Detect HVAC issues before costly failures occur with Monnit Wireless Sensors! To install wireless temperature sensors, we recommend mounting the sensor just outside the door and running the sensor probe through the door seal or cooler wall. Alternately for temporary use, you can run the probe wire over the door seal but this will not allow for a tight door seal. 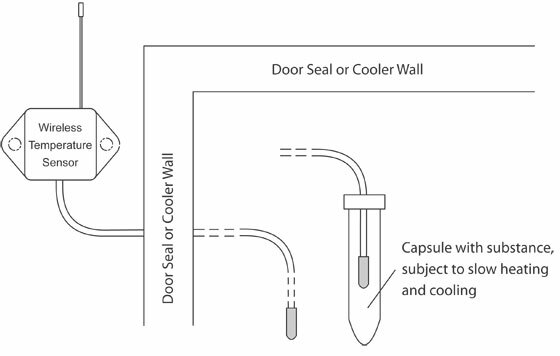 To install through the seal or cooler wall, start by drilling a hole just larger than the size of the temperature probe in the seal or wall. Push the temperature probe through the hole and use clips or twist ties to secure the probe wire to the interior wall or shelving. When you have the sensor mounted outside and the probe ran to its desired location, use silicone caulking to seal the hole around the wire. To install a wireless open/closed sensor on the door of a walk-in cooler or freezer simply mount the sensor, using the included screws or double sided tape, just above the cooler door. Next you will need to attach the sensing element (screws or double sided tape) to the door frame as close to the door as possible, making sure that it does not interfere with the door opening or closing. 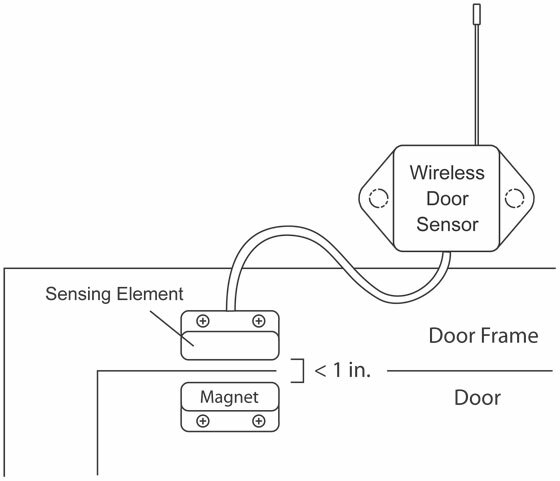 With the door closed, attach the magnet to the door directly below the sensing element. The magnet must be within 1 inch of the sensing element in order for it to function properly, so try to keep the magnet as close as possible without interfering with the door opening or closing. In order to get the best performance out of your Monnit Wireless Sensors, it is important to note proper antenna orientation and sensor positioning. Antennas should all be oriented in the same direction, pointing vertically out of the sensor. If the sensor is mounted flat on its back on a horizontal surface, you should bend the antenna as close to the sensor housing as possible giving you the most amount of antenna pointing vertical. You should make the antenna wire as straight as possible, avoiding any kinks and curving of the wire.